My guest post today is from Holly Cardamone who shares her delight in gardening and children's literature, a wonderful combination. Holly Cardamone is Green Mama, a Melbourne mum, who before children worked as a communications advisor and freelance writer. 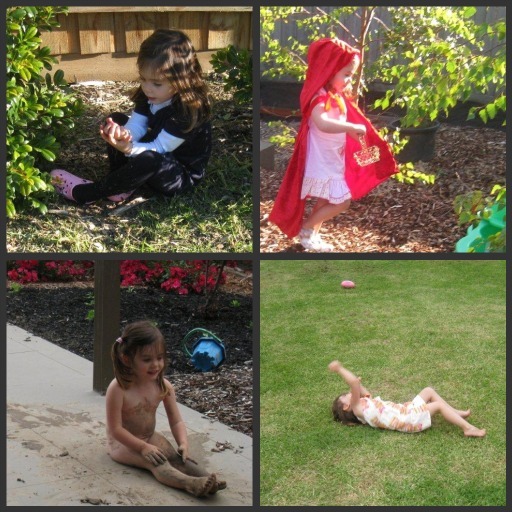 She chronicles her family life at Adventures in the Land of Cherubs. I have a quote by Cicero above my desk: ‘If you have a garden and a library, you have everything you need’. As we make our way through our day, my cherubs and I weave all that is wonderful about gardening, literature and learning, all the while getting our hands dirty. I read a lot as a child. I had a deep understanding that it was through books and reading that I could make my life richer in all aspects of the word, an understanding I want my cherubs to experience. I read almost constantly. My parents would often find me sitting in a tree reading, or lying with a book between massive daisy bushes on a banana lounge (hey, it was the 80s! ), with the hum of bees doing their marvellous work as my soundtrack. Gardens too have always spoken to me. They foster imagination in so many ways. As I’ve re-entered the beautiful, magical world of children’s literature over the last four and a half years, our reading experiences have undoubtedly influenced our garden plans. The strawberry and raspberry patch we have next to the cherubs’ playhouse was inspired by Hairy Maclairy from Donaldsons Dairy. The silver birch grove was inspired by a beautifully illustrated book called Small by Jessica Meserve. The dry creek bed with its mini-forest of natives and shaded by the gum trees behind us replicates a Snugglepot and Cuddlepie world. We built decking off the playhouse to make that space less prescriptive. The decking has been a shop, a cafe, and a stage where I’ve sat through many a concert, puppet show and drama performance. It’s also a fantastic space for a Mama (or two or three) to sit with a cup of coffee with the cherubs in full view. I’ve told my cherubs that books teach them about the world, and that it gives them a space to explore the world. Of course, these are just meaningless words to young children. But I’ve looked out to our grove of silver birches to see a teddy sitting at the foot of one tree, and my older cherub weaving in and out of the others, muttering ‘it’s dark and horrible in here,’ straight from the pages of Jez Alborough’s Where’s My Teddy. We had a family of owls take residence in our tree, hooting each night. A baby owl fell out of the nest one morning, and my older daughter said ‘I think that one must be Sarah. Bill would be jumping up and down crying for his mummy.’ Clearly, the 57,000 times I’ve read Martin Waddell’s Owl Babies has had an impact. We use our experiences outside to reflect and extend upon the reading we do inside. The garden inspires and prompts play and inevitably literacy. As we play, we recite poems and ditties such as Ladybird, Ladybird. We make potions and lotions, a favourite being mudpie dip. I love the incidental learning that takes place as my cherubs help themselves to the strawberries in their patch. While I’m planting out new veggies, I’ll focus on the vegetable I’m planting, and ask my older daughter if she can think of a book or a song that features that vegetable. Whilst jogging around the perimeter of the trampoline we chant. 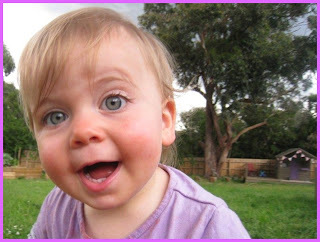 My daughters like language that’s evocative, and of course the louder and more animated I am the better. I bellow ‘who’s that trip trapping over my bridge?’ as they run past me squealing. We weave words in and out of our days, acting out storylines spontaneously and as the moment arises. In March, as the apple tree dropped the last of its harvest, the girls and I sat beneath it and started howling ‘oooh eee’ in honour of Pamela Allen’s Mr McGee, who as we all know, loves sitting beneath his spreading apple tree. I want my cherubs to enjoy learning. I want them to be deep thinkers and to have a keen sense of observation. Although sometimes I tie myself in knots coming up with an answer to some of the whoppers thrown at me, I encourage their questions. They are (usually) all valid questions, asked in such a spirit of curiosity that they deserve a valid answer, not always easy to provide. 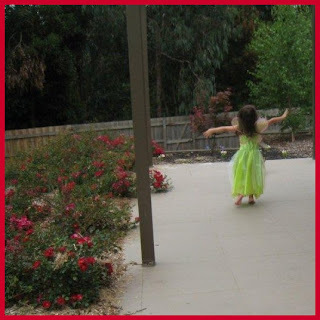 One of the most important goals for our garden design has been to provide a safe, exciting space for our cherubs to explore, and for their mind's eye to roam. We wanted to build a place to enhance their creativity, one where they can discover, go on quests, nurture their imagination, all whilst under my covert supervision and within the boundaries of our home. Most importantly, it’s a space where we have fun - what I see as the heart of their childhood.